Cleanup required: System list needs some love. Flappy is a puzzle game, in the same vein as The Adventures of Lolo and Sokoban (Box boy), that is little known outside of Japan. It features some manner of creature, possibly a yellow mole, named Flappy who must ultimately push a blue stone from its starting place to the blue platform destination. What makes this such a difficult task, is the presence of gravity, gaps in the floors, and wandering enemies that would like to eat Flappy. Flappy can pick up and throw sleeping mushrooms at the enemies to knock them out for a while, or drop stones on them to crush them permanently. Flappy first appeared on the Sharp X1 home computer. This debut was soon followed by with conversions to a number of popular Japanese computers in the early 80s, including the NEC's line of PCs, and the Fujitsu FM series. As a puzzle game, it was well suited to these early systems, since it didn't require a tremendous amount of graphical sophistication. 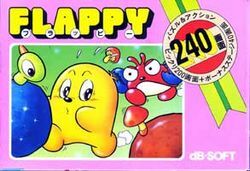 As the MSX computer, and the Nintendo Famicom grew in popularity, conversion of Flappy were released on those platforms as well. The developer dB-Soft produced a sequel with more difficult puzzles called King Flappy for the benefit of anyone who managed to clear the original 200 levels. Over time, Flappy has continued to see many graphically improved upgrades, such as on the Windows platform and on several mobile phone devices. Note: The following controls are for the Famicom, but should be equally applicable to all versions of the game. : Use the direction pad to move Flappy in any one of four directions. Flappy can continue to move in any direction provided a wall or enemy is not in his way. Pushing Flappy against a stone will cause the stone to slide left or right until there is nothing solid beneath the stone. Walking into stones that have no where to go will cause them to break. : Use the A button to throw a sleeping mushroom in whichever direction Flappy is facing. : After throwing a mushroom, press and hold the B button while using the D-pad to control the movement of the mushroom while it's still flying around. You lose control over the mushroom as soon as it hits a wall. : Press the select button at the title screen to enter a password and select which background music you would like to hear before playing. : Press the start button to pause the game. + : Press these two buttons together in the middle of game play to sacrifice your life and start a level over when you feel that you are trapped without any hope of clearing the level. Flappy: This is the title character of the game, a yellow mole-like creature, whose one and only goal is to push one blue stone on to one blue platform in every room. He may not look like much, but he can push heavy stones, and throw sleeping mushrooms. Flappy will lose one chance whenever he is touched by an enemy, or when he is squashed by a falling stone. He can also sacrifice himself if it appears that he has placed himself in a situation that is impossible to win. Careful thought and planning must be used in order to help Flappy with his goal. Unicorn: The Unicorn is a simple enemy. All he can do is bob to the left or to the right, and never up and down. So whatever row he is situated in is the only row that he can ever attack you in. Despite this constraint, Unicorn is still a deadly foe since his motion is hard to predict. When you move Flappy into his row, he will tend to charge Flappy. Other times, where Unicorn will move next is anybody's guess. It's relatively easy to drop rocks on Unicorn, but sometimes he can be rather useful in helping Flappy achieve victory in a stage when he's asleep. Ebira: Ebira is a rather "crabby" enemy (the word "ebi" is a Japanese term for shellfish). Unlike Unicorn, Ebira is not locked into any one particular row, and can move freely about the stage just as Flappy does. Ebira will wander around in search of Flappy until he can "see" Flappy, at which point he will charge. Staying away from Ebira's pincers can be tricky, and only wise use of stones and mushrooms will keep him from being a nuisance. Just like Unicorn, sometimes Ebira is necessary to help Flappy get the blue stone to its home. Mushrooms: Pick up the mushrooms that you find scattered around each stage to use as weapons against the enemies. Every time an enemy is hit by a mushroom, they fall harmlessly asleep. But that sleep won't last forever, so make sure you give yourself enough time to do whatever you need to do before they wake up. After you throw a mushroom with the A button, you can hold down the B button and guide the mushroom with the D-pad until the mushroom hits a wall, at which point it will fall down to the ground. Bonus points are awarded for any mushrooms you have remaining when you complete a stage. Stones: Brown stones are the normal type of stone that you find in each stage. They are quite commonly the key to moving the blue stone from wherever it begins to wherever it needs to go, either as a bridge, or as a method to transport the blue stone across a platform. They can be useful as weapons, crushing and permanently removing any enemy that it falls on, but make sure that the stone you use for this purpose isn't a stone that is necessary for the solution of the stage, or you may leave yourself with no means of beating the stage. If Flappy pushes upon a stone that has nowhere else to go, Flappy will end up crushing and destroying the stone, taking it permanently out of play unless Flappy dies. Blue Stone and Blue Platform: In order to complete every stage in the game, the blue stone must be successfully moved on to the blue platform. No other condition will advance Flappy to the next level. When you enter a stage for the first time, take some time to study it, and see if the solution is apparent to you. Some levels will not be so obvious, and sometimes you need to learn new techniques in order to solve a stage. Take your time and proceed when you have developed a strategy. In order to complete many of the levels in Flappy, you must rely on a few techniques that enable you to move the blue stone throughout a room without getting it stuck. If the blue stone ends up in a position that you can not recover it from, you will not be able to clear the stage, and you will be forced to give up one of your lives in order to try again. Mastering these techniques won't help you solve every problem in the game, but they are the basic building blocks for more complex solutions. There are many more advanced techniques that you need to discover on your own. Blue Stones will fall into gaps in the floor just like regular stones will. When there's a gap between the Blue Stone and the Blue Platform, make sure that you first fill it with a regular stone so that you can push the Blue Stone over the gap without losing it. Sometimes you will find a regular stone in the way, or blocking the progress of another stone that you need to move. When this is the case, simply push against the offending stone and break it apart so that you can clear a path to the stone you intend to push the other way. You will frequently need to guide Blue Stones down staircase-like structures. The problem is, if you push a Blue Stone down a step, it will get stuck in the corner. Instead, make sure that a regular stone is at the foot of the step, and push the Blue Stone off of the regular stone. That way, when you're done, you can break the regular stone and continue to push the Blue Stone. Enemies are obviously present to make your life harder. But when it's obvious that they can't be used to aid you in finding a solution, the next best thing is simply remove them. Using mushrooms to put enemies to sleep is nice for a while, but nothing does the trick of removing an enemy better than crushing them with a rock. The timing can be tricky, especially with the random motion of the Unicorn, so practice for a while in the beginning. Even the best players will occasionally miss. Sometimes it is necessary to move a blue stone from one high position, across a valley, and over to another high position. Since you can't let the Blue Stone touch the ground, you need to support the Blue Stone with regular stones. You can push a Blue Stone on top of a regular stone, and alternate between pushing the regular stone a little bit, and the Blue Stone a little bit, until the Blue Stone is push close enough to the other side. It won't take a lot of playing before you realize that the game is played on a grid. Each stone is the size of two grid squares. As a result, when there is a gap that is two stones wide, only one stone is needed to slide another stone across. Make sure that the stone ends up squarely in the center of the gap, or the next stone will fall on the other side. The following are all things that you need to avoid, or you will not be able to finish a level. As mentioned above, you must never let a blue stone land squarely inside a corner, or there will never be any way to get it out from there. Use the Pushing stones technique to avoid this losing situation. Similar to the corner trap, do not get an enemy stuck between the Blue Stone or the Blue Platform. Unless there is a way to crush the trapped enemy from above, there is no way to get the stone on the platform. This page was last edited on 14 January 2012, at 01:21.